So what’s that got to do with me? That admonition from the ancient Greeks must surely have crossed their radar screens at some point in their lives. How good that, no matter how uncomfortable it may be for us (the putatively sane), they have ignored it completely. Most Americans can see this for what it is, even many Democrats and Lefties, those who are not demon drones in skin suits, and neither like it nor are intimidated by it. The more they act out the more repulsive they become. They think they are cheerleading a blue wave. Nope. Insanity has consequences. Republicans in the Senate seem to have grown a spine – unexpectedly – pray that they continue. Its almost as if they realize that the Democrats are not acting in good faith, or maybe that their chances of electoral victory depend on (gasp!) actually keeping their promises. A few calls to the Republican leadership in the Senate to remind them of that would be in order. Alas, trying to get through to our own Senators is a waste of time. 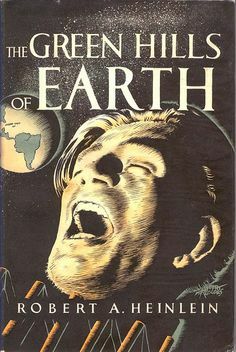 I suppose I could call for charity’s sake, to give them my share of fair warning, but I’m all out of charity for the willfully, and invincibly malicious. 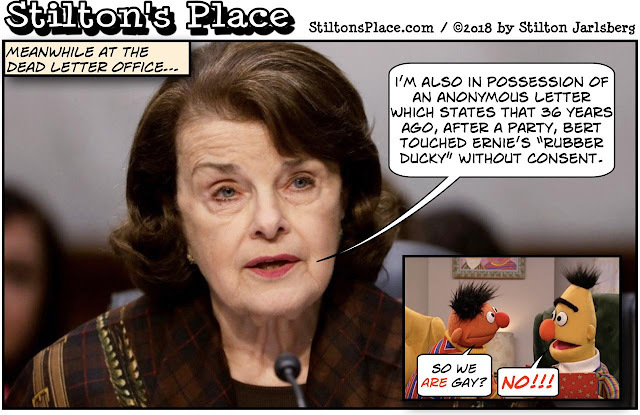 As for Old Facepalm Feinstein’s accomplice, for that is exactly what Professor Ford is, much is already known and more will be discovered. For starters, she attended an all girls High School that prided itself on the slutty behavior of its student body, bragged that the best of times were parties where getting totally blotto was pretty much de rigeur, and bragged about it in their yearbook. Which yearbook was taken offline shortly after the accuser was taken public. Fortunately a thoughtful soul looked it up and saved it from the memory hole. You have to read it to believe it. No wonder, since she recalling this years after the fact, that she doesn’t know when Kavanaugh allegedly groped her, or whose house she was in or why she was there. It could have been Kavanaugh, though he denies that he was there and the supposed witness retracted the testimony. Hell, it could have been any of scores of boys orbiting her High School set. It is all made more incredible in that she is herself a member in good standing of the Left’s lunatic fringe, that her lawyer has close ties to persons high in the ranks of the Demoncratic party, that she was coached and groomed by Demoncratic operatives, that she agrees to talk the the Senate committee then won’t, that she lies, that Old Facepalm held the letter back for two months (which is illegal, BTW), and so much, much more. The Commiecrats are the purveyors of Robert Heinlien’s Crazy Times. If allowed to continue they will destroy not only America, but civilization itself (no, I do NOT exagerate). For the sake of our own futures, the futures of those we love and for love of our Constitution and our Country we must oppose these people at every level. We in the Republican Club have committed ourselves to do all we can remove these wicked lunatics from any position of power by electoral means. We took a decision two months ago to replace Adam Schiff Head Schiff. 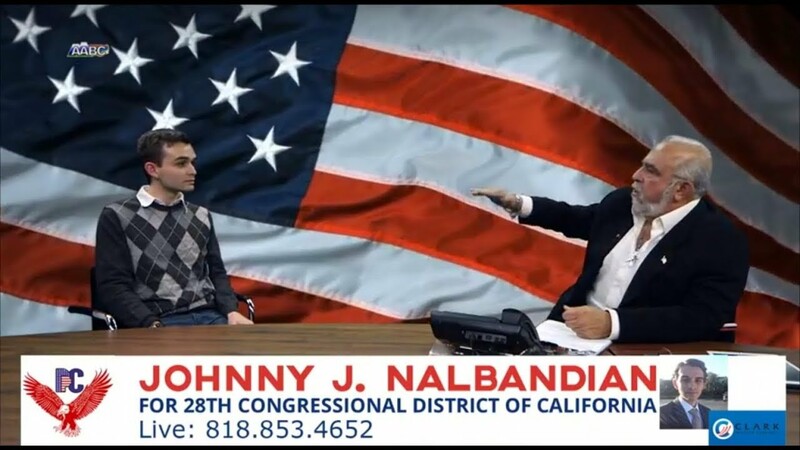 I mentioned recently that his Republican opponent is Johnny Nalbandian. If we are to successfully follow through with our commitment we have a lot of work to do. Even though 44% more ballots were cast in the 28th District 2018 Primary than there were registered voters, we can do this. If its not close they can’t cheat. I now have precinct walking lists, come and get them. Put Schiff away, get Nalbandian in!